Hey Snow, where’d you go? In 2012, Snow White and the Huntsman gave the age-old fairy tale a sassy new action-y feminist twist, with Kristin Stewart as the feisty, fair-skinned maiden—foretold by the Magic Mirror to be the loveliest in the land—and Chris Hemsworth as the evil queen’s “huntsman” ordered to take her into the woods and kill her. Of course, things didn’t quite work out that way—and now we have The Huntsman: Winter’s War, a sequel. Actually it’s a prequel. Well, I think it’s a little of both, and a mash-up of several other things, too, and quite a bit of an all-around muddled mess. And Snow White seems to have wisely decided to steer clear from it all. So there’s no Snow in this Huntsman, unless you count the times she’s mentioned by name. But the movie certainly isn’t hurting for other talent. 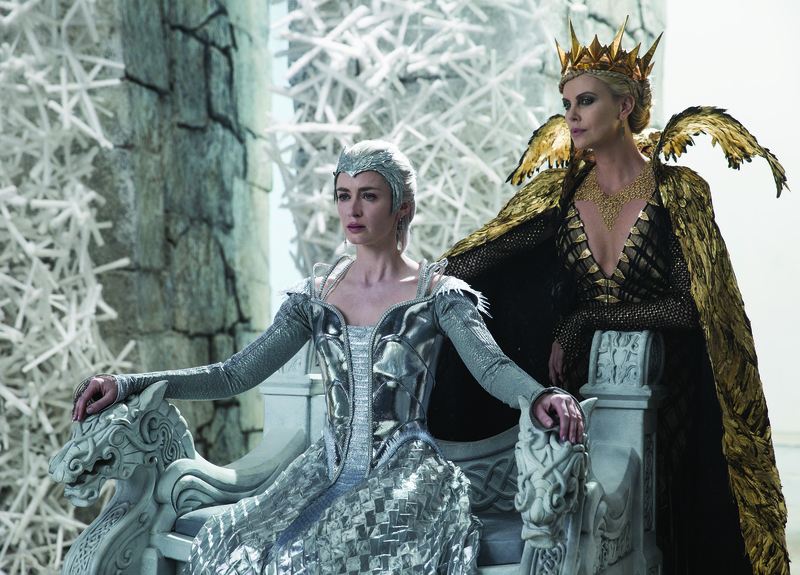 Hemsworth is back, and so is Charlize Theron as the wicked monarch Ravenna. Emily Blunt is newly aboard as Ravenna’s sister Freya, turned into a cruel “ice queen” by an act of heartless treachery. 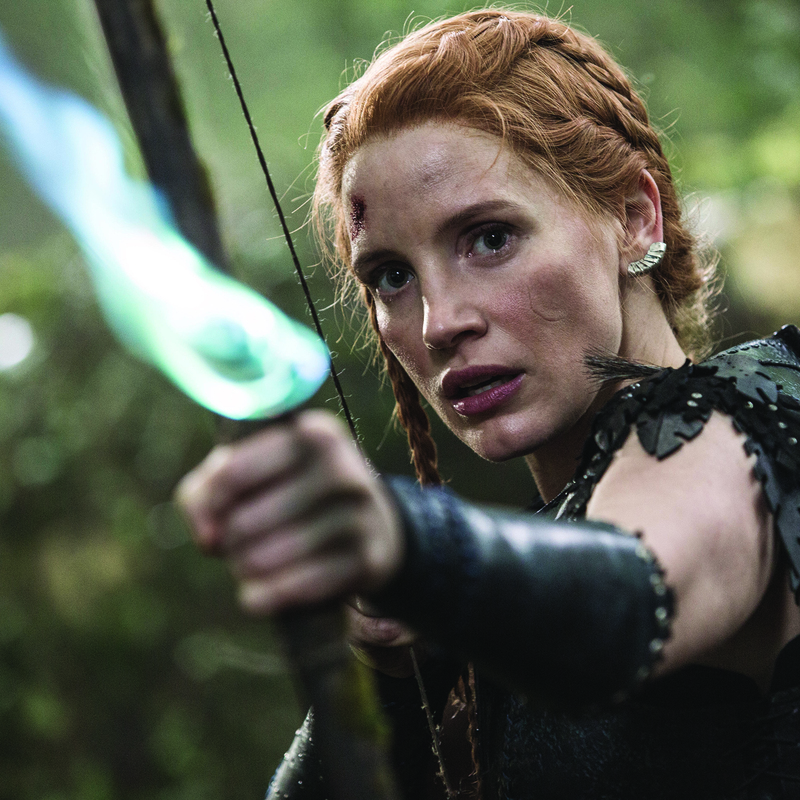 Jessica Chastain is Sara, who like Hemsworth’s rebellious Huntsman, grew up as an abducted child soldier forced to serve in Freya’s army of marauders. British comedic actors Nick Frost and Rob Brydon, shrunk to wee size by the modern magic of digital effects, play a pair of dwarf brothers who provide most of the chuckles in this otherwise dull and dreary trek through a disjointed plot that feels like someone threw bits of Game of Thrones, Disney’s Frozen, Lord of the Rings and The Wizard of Oz into a blender with some crushed ice, black goo and gold flecks, then set it to puree. If you’re into ornate costumes, you might dig the over-the-top duds in which Blunt and Theron get to vamp. In the couple of scenes they’re together, I kept wishing Cher would suddenly appear—maybe descending from the ceiling—for a full-on Las Vegas revue. The storybook decor is lush and quite lovely, especially when the Huntsman, Sara, the two dwarves and their special-effect dwarf dates (Alexandra Roach and Sheridan Smith) take a day trip to Goblin Land, or something like that, to retrieve the purloined Magic Mirror, which looks like a huge polished cymbal from a music store. Some of the location filming was done in England’s Windsor Great Park, although I’m pretty sure you won’t find any big, blue ape-men, giant moss-covered snakes or tiny florescent flying fairies there.